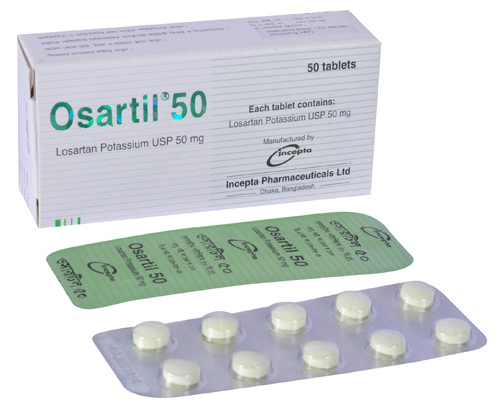 Osartil 25: Each tablet contains Losartan Potassium USP 25 mg.
Osartil 50: Each tablet contains Losartan Potassium USP 50 mg.
Osartil 100: Each tablet contains Losartan Potassium USP 100 mg.
Osartil (Losartan Potassium), the first of a new class of antihypertensives, is an angiotensin II receptor (type AT1) antagonist. Angiotensin II is a potent vasoconstrictor, the primary vasoactive hormone of the renin-angiotensin system and an important component in the pathophysiology of hypertension. Losartan and its principal active metabolite block the vasoconstriction and aldosterone secreting effects of angiotensin II by selectively blocking the binding of angiotensin II to the AT1 receptor found in many tissues. Osartil is now regarded as the first-line therapy option for treating high blood pressure. Losartan is indicated for the treatment of all grades of hypertension, Chronic heart failure, Stroke risk reduction in hypertension & LVH and Nephropathy in type 2 Diabetes. It may be used alone or in combination with other antihypertensive agents. It is an effective alternative for patients who have to discontinue an ACE inhibitor because of persistent dry cough. Hypertension: The usual starting dose is 50 mg once daily. In patients with possible depletion of intravascular volume or patients with a history of hepatic impairment, starting dose is 25 mg once daily. Losartan can be administered once or twice daily with total daily doses ranging from 25 mg to 100 mg. No initial dosage adjustment is necessary for elderly or renal impairment patients. If blood pressure is not controlled by Losartan, a low dose of a diuretic (Hydrochlorothiazide) may be added. Losartan may be administered with or without food. Chronic heart failure: 12.5 mg once daily, increased at weekly intervals to 50 mg once daily if tolerated, Stroke risk reduction in hypertension & LVH: 50 mg once daily. Hydrochlorothiazide 12.5 mg daily should added. Maximum dose-Losartan 100 mg followed by Hydrochlorothiazide 25 mg once daily. Nephropathy in type 2 Diabetes: 50 mg once daily. Maximum dose-100 mg once daily. 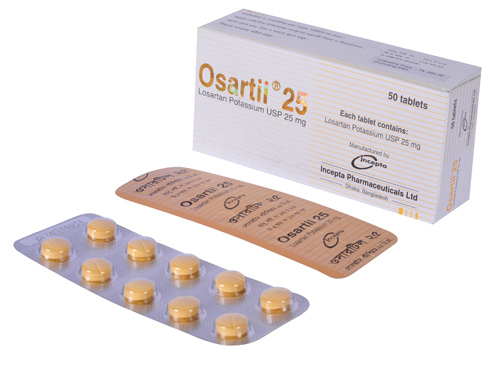 Overall incidence of adverse effects of Osartil is comparable to placebo in clinical studies. The most common adverse events occuring with Osartil at a rate of >1% above placebo were upper respiratory infection (7.9% vs 6.9%), dizziness (3.5% vs 2.1%) and leg pain (1.0% vs 0.0%). Osartil should be used with caution in patients with known hypersensitivity to the drugs that act through renin-angiotensin system. Special precaution should be taken when it is administered to the patients with renal and hepatic impairment. Safety and effectivenss of Osartil in pediatric patients have not been established. 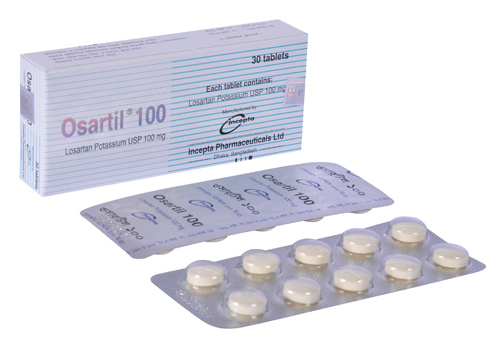 Osartil must be discontinued as soon as possible when pregnancy is detected. It should not be prescribed during lactation as there is no information in humans on the passage of Losartan (Osartil) into breast milk.